Happy First Monday after Daylight Savings Time! If ever there was a time to initiate change, the time is now. While most people choose New Year’s to make changes or goals, I’ve found that holding off until the weather is ready to change makes it easier to hold yourself accountable, and just let winter be what it is – a hibernation period. This may seem like a long opening paragraph that has nothing to do with clothing, what I’m about to say will probably better explain this lead-in than I can in another sentence. I’m in support of cargo pants. Now, you guys may have put that together when I shared 5 ways to wear the modern cargo shorts, and while there was some pushback, I still am totally into them and would love to see you rock ’em. As with the shorts, these cargo pants that I want to see you wearing are not the cargo pants your mean older brother was wearing in the early 2000’s. Today’s cargo pants are slim through the leg, and you shouldn’t be able to comfortably hold a can of Bud Light in one pocket and your whole dopp kit in the other. They are a great casual alternative to jeans and chinos, and they nod to the military trend that has been in style for what feels like forever. Also, they are the perfect weight for spring weather! 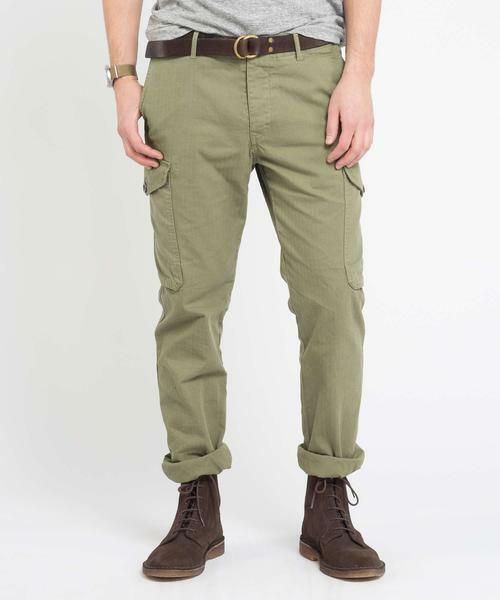 The modern cargo pants are slimmer in cut, with pockets that add visual interest, without the bulk. Wear it well: Dress up your cargo pants for a creative work place with a blazer – roll up the cargo pants AND push your sleeves up to give it a lived in look. Wear it well: A few pops of color make your running errands outfit feel more fun. Wear it well: Dress your cargo pants up with a textured sweater and topcoat for a rugged gentleman vibe. Wear it well: A short sleeve shirt, half zip and derbies take your cargos from work to drinks. Wear it well: A breton shirt and a suede collared jacket elevate cargos while still keeping things casual. HOW WOULD YOU STYLE THE MODERN CARGO PANT? Want to see more ways to wear your favorite pieces? See five ways to wear lace up boots, a breton shirt and brown derby shoes.